Oil-Electric: Lehigh & Hudson River "Charlie 420's"
Lehigh & Hudson River "Charlie 420's"
British Columbia Rail 632, North Vancouver BC, August 14, 1992. My late wife and I have journeyed north from our home in Vancouver Washington on a dream trip in British Columbia. First stop, Vancouver BC, to visit my “home town” – North Vancouver, taking in the magnificent sites including the Stanley Park Zoo (shuttered the following year) Grouse Mountain at sunset, and, of course, the stripped down Pacific Great Eastern, now known as British Columbia Rail. The only units I could find were this Charlie 420 and a slug. They were just sitting there burbling, with nary a soul in sight! Patti got a wonderful profile shot of me gathering builder’s plate information! I said “Dream Trip” – you bet! We motored up the Sunshine Coast, hiking more than a mile into Skookumchuck Narrows, to see it at maximum flood (up to 18 mph! ), exploring Powell River taking one of the last mill tours before it was shuttered, and then over to Vancouver Island, where we joined the Uchuck III for a fantastic overnight trip to Kyuquot, on the remote West Coast of Vancouver Island. This unit was one of nine originally built for the Lehigh & Hudson River Railroad. 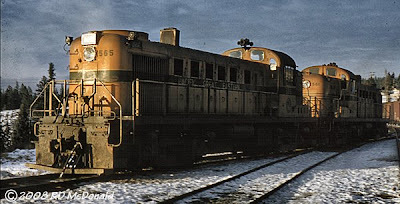 When L&HR ceased operations in March of 1976, British Columbia Rail purchased L&HR 25 and 26. The remainder were absorbed into another ugly merger known as Conrail. 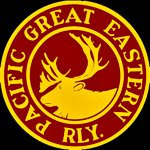 Sadly, Patti is gone and BC Rail, which I knew and appreciated as the Pacific Great Eastern is also gone. BC Rail S-409. Originally built as Pacific Great Eastern 565 by Montreal Locomotive Works, June 1951, as an RS-3, 1,600hp, serial number 76108. Became BC Rail in 1972. Re-built as a “slug” in 1987. Here she is as I first saw her on a damn cold day in November 1959 setting out a cut from Pacific Great Eastern northbound #24 at Williams Lake, Lillooet Subdivision Mile Post 156.3. BCOL 632 is now on the Arkansas & Missouri as their 57, meeting up with other ex L&HR sister units. In my own backyard - Updated Update! In my own backyard! Updated.